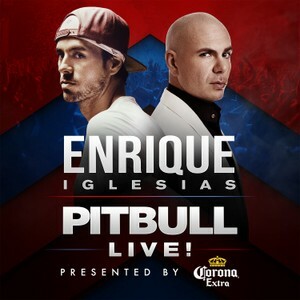 (Corpus Christi, TX April 21, 2017) – One of the hottest tours of the summer will continue well into the fall when two of the most engaging live performers in music today, multi-platinum selling and multiple Grammy Award-winning global superstars Enrique Iglesias and Pitbull, share the stage for an additional 18 dates, announced today. The tour is exclusively produced by Live Nation and presented by Corona Extra, the fall dates begin on Friday, September 22, with a return to Toyota Center in Houston, includes stops in hometown of Miami, Washington DC, Philly and Boston, as well as returning to Chicago, Los Angeles, and more, with the final date on Saturday, October 28, in Oakland, CA at the Oracle Arena. Full itinerary below. The co-headlining North American tour adds another summer date with an additional Madison Square Garden show on Saturday, July 1 – with multiple shows sold out including Chicago, San Jose, Los Angeles, San Antonio, Houston and Montreal. CNCO will join as special guest on all but three of the of the fall dates, as noted below. For more information please visit livenation.com. Making global music, Pitbull flaunts a style that’s indisputably his own. Releasing his full-length debut, “M.I.A.M.I” in 2004, followed by the success of 2006’s “El Mariel” and 2007’s “The Boatlift.” In tribute to his father, he delivered his first Spanish-language album, “Armando,” in 2010. He grinded it out on the road and touched down everywhere from the Far East and South America to Europe and all across the U.S. His success continued as he went on to release additional chart-topping platinum hits, including “Timber” [featuring Ke$ha], “Fireball” [featuring John Ryan] and more. On March 17, Pitbull released his 10th full-length album, Climate Change, after wrapping his second headlining arena run – “The Bad Man Tour,” named after the Climate Change hit single performed on the 2016 Grammy Awards. Pre-Sale begins on Thursday, April 27 at 10:00am. Tickets go on sale Friday, April 28 at 10:00am. Get your tickets at ticketmaster.com, the American Bank Center box office, or by phone at 1-800 -745-3000. SMG managed American Bank Center is Corpus Christi’s premier event center. Follow us online atwww.Americanbankcenter.com, facebook.com/AmericanBankCenter, twitter.com/AmericanBankCtr, on Instagram @americanbankcenter, Tumblr @AmericanBankCenter, on Periscope @Americanbankcenter. and now on snapchat @americanbnkctr.